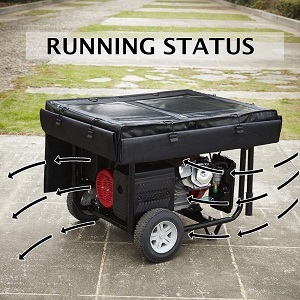 If you want to use your portable generator during wet weather, use this IGAN Heavy Duty Generator Rain Shelter Cover to protect your generator while outside. For safety purposes you need to run your portable generator outdoors, but when it is snowing or raining you also need to cover your portable generator to protect it from the severe weather. This generator rain canopy enclosure cover solves that delimina. 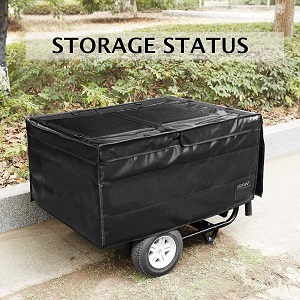 This black tarpaulin enclosure is compatible with 3500 watts to 12000 watt generators with tubular or square frame. It is heavy duty cover that will keep the electrical panel and outlets dry while the generator is running outdoors in severe weather, yet ensure safe ventilation. When your portable generator is not in use this tent will cover the entire generator while in storage. I have a small storage shed that I put my generator in when not in use and then pull it out onto a covered front porch when running it. But, even then if it is a blowing rain or snow then the generator will still get wet. Some people have to run their portable generator out in the yard when it is raining or snowing. This IGAN waterproof, heavy duty tarp cover with its high-strenght fiberglass frame rods will give your generator s rain, snow, wind and sun shelter. When in storage the cover protects your generator from dust and cold so your generator is ready to go when you need it. It weighs in at 9 lbs. and has an easy toolless installation. This is a universal cover that fits generators with square and tubular frames and applies to different tank filler ports and handle positions. It is very easy to use because the electrical skirts are suspended from the metal buckles on the top during running (except for the side with the electrical panel). These skirts will not block the intake, vent and exhaust areas of your generator. When you don't have a need to run your generator then simply put down the skirt sides to protect the generator from the environment while in storage. Another nice thing about this cover is the thick fabric and built-in filler prevents this tent cover from billowing in the wind. I think the black cover is less of an advertisment to would be thieves that you have a nice, expensive generator underneath. If you are paying attention then you know that manufacturers issue plenty of warnings about running your generator in a garage or too close to an open window in your home. The risk is CO poisoning. But, too many people take this risk because they do not feel safe running there generator out in the rain or snow. Using your generator in wet weather can allow water into the outlest and then you risk damage to your portable generator and possible electrocution to yourself. Some of the generators on the market have ground fault circuit interrupt (GFCI) outlets which will shut themselves off when they get wet. Not only would your generator be of no use to you, but you certainly would not want to go near it until it drys out. If you have stored your generaor outdoors, uncovered and unprotected from the weather, moisture or ice can cause a short circuit in the electrical components that could result in electrocution. A good generator tent enclosure that is designed to protect your generator from inclement weather, be it during a power outage at your home or just while you are camping or tailgating, is a good investment. You not only protect your generator but yourself and have an alternative power source available when you need it most. Not only do you need to cover your generator during the rain and wet weather but also while it is in storage. 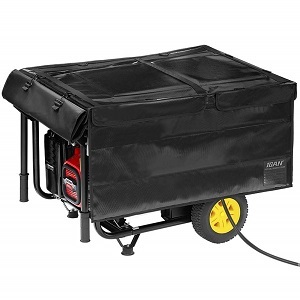 The IGAN Heavy Duty Generator Rain Shelter is easy to covert from an outdoor cover while raining to a full generator cover while in storage.